A Florida LLC is formed by filing Articles of Organization with the Secretary of State and paying the appropriate filing fee. A Florida LLC is governed by its Operating Agreement, which is written and agreed upon by its members, and which lays out the management structure of the company. Each member offers a capital contribution in return for an ownership percentage. Learn more below about the structure of a Florida LLC and how one is formed. Florida Articles of Organization (Limited Liability Company). A Registered Agent located in Florida. See our service here. FL Limited Liability Companies are structured legally with the Florida Articles of Organization for a Limited Liability Company. Like many states, the document for an LLC is short and simple. A name for the Florida LLC name must not be indistinguishable from another name on record with the Division of Corporations. The Florida LLC name must also include a marker that reads “LLC”, “L.LC.”, or “Limited Liability Company”. If the LLC is a Professional LLC, it must include the words “Chartered”, “Professional Limited Liability Company”, “PLLC” or “P.L.L.C.”. The Principal Office address and the Mailing Office address will be provided when creating a new Florida Limited Liability Company. You can use a PO Box as the mailing address, but the principal address can not be a PO Box. 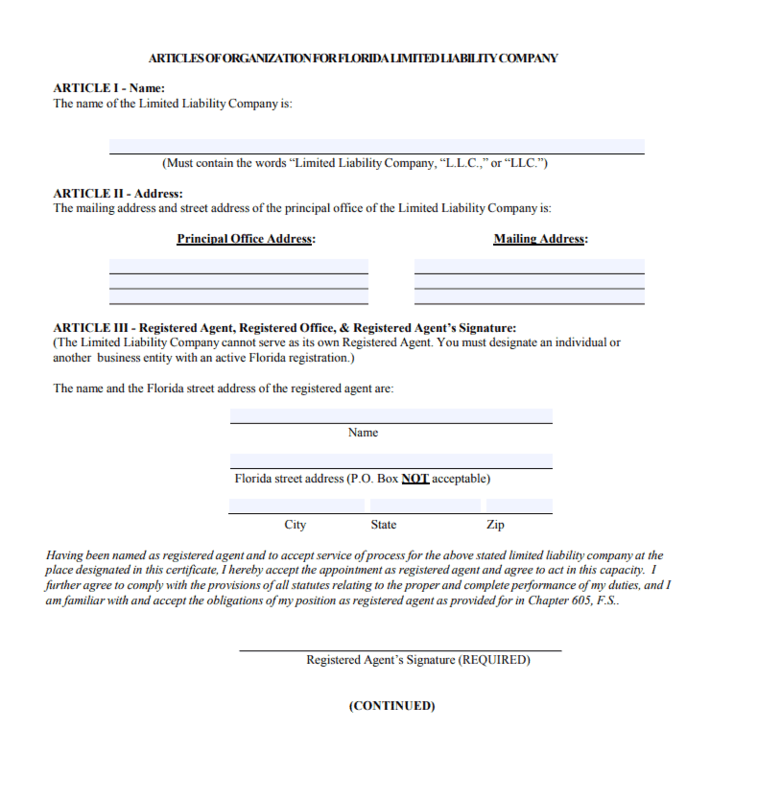 The Florida Registered Agents information and signature is required to open a new FL LLC. If filing online, the registered agent must type their name in the signature box. The name and e-mail address of the person to receive correspondences will be listed on the Florida Articles of Organization. The state will send annual report notices to this e-mail address provided. List the Managers or Person(s) authorized to manage the LLC. An Authorized Representative (AR), Authorized Person (AP), or Authorized Member (AMBR) is a person who is authorized to execute and file records with this office. See 605.0102, F.S., for more detail. If all of the members of a limited liability company will not have authority to manage or act on behalf of the business entity, then the limited liability company will be manager-managed. In a manager-managed limited liability company, the members elect those individuals, which will have the authority to manage or act on behalf of the company. Those individuals will serve in the capacity of a manager (MGR). A manager (MGR) may or may not be a member of the limited liability company. Fill Out Articles of Organization: To form a Florida LLC, you must submit Articles of Organization to the Division of Corporations. This document can be filed online, or it can be mailed or hand-delivered. Appoint a Registered Agent: A Florida registered agent is appointed on the Articles of Organization. You cannot form an LLC in Florida without one. Pay the Filing Fee: The Division of Corporations charges $125 to form an LLC. This includes a $100 filing fee and a $25 fee to appoint a registered agent. Wait for Processing: Processing times differ depending on how the document is filed. Online filings usually take only two days. A mailed or hand-delivered submission can take as long seven business days to fully process. Can I Fax My Filing to the Division of Corporations? Yes. It is possible to fax filings to the DOC, but only with a Sunbiz E-File Account (which must be set up beforehand). Read our info page to learn how to create a Sunbiz E-File Account. Faxing documents to the DOC is not considered an expedite option, but it does significantly increase processing time. What Are Limited Liability Protections? Limited liability refers to the degree to which a business owner is liable for debts and obligations. Limited liability means that a creditor can only legally seize business assets as a means of settling debt. A creditor cannot seize the personal and private assets of a business owner (such as their home or their retirement investments). In this way, the liability a member is responsible for is limited to their investment and interest in the LLC. A Florida registered agent must maintain a registered office within the state (a physical street location, not a PO box). In order for service of process and important business mail to be accepted in person, the registered office must remain open during regular business hours throughout the year. When documents are accepted, they must be forwarded to clients in a timely manner. In order to form an LLC, it is best to write an operating agreement, the document which governs who owns the company (the members), their rights and responsibilities, the management structure (member-managed or manager-managed), and various operational issues, such as when and where annual meetings will be held. What Are the Advantages of a Florida LLC? Generally, entrepreneurs form an LLC because the entity structure allows for less formality, ease of management, and lighter taxation. Corporations, by contrast, are top-heavy with the amount of formal administrative roles, the number of meetings and the amount of paperwork required. Corporations also suffer from double taxation (taxed both at the entity and the individual level). Small businesses, especially family run businesses, often find it simpler to form an LLC in Florida rather than deal with the formal complexities of a corporation. Annual reports are due every year between January 1 and May 1 the calendar year following your initial registration. The fee to file the Florida LLC Annual Report is $138.75. If you file after that period of time, a $400 fine is imposed on your Florida LLC. Corporate Filing Solutions always sends annual report reminders to make sure you pay your fee on time. Why Hire Corporate Filing Solutions to Form Your Florida LLC? Starting your LLC in Florida shouldn’t be a hassle or a time consumer. That’s why we offer Filings Made Easy™ to make starting an LLC in Florida super easy. Hire us and relax while our filing experts form your new Florida LLC. Our staff will process orders the same business day as they are received. To make things even easier, we bundle the first year of Registered Agent service and ensure your Florida LLC comes fully equipped and ready to do its job. Start your LLC in Florida and get Registered Agent service for as low as $55 a year.